This time of year, we are inundated with hearts. They're everywhere. For me this isn't just a reminder of that special someone in my life, it's also a reminder to help take care of my own heart. So I figured that I'd share with you some great food to add into your diet in order to help keep your heart healthy. One trick to better eating, in general, is to “eat the rainbow.” I'm not talking about consuming large quantities of brightly colored, fruit flavored, candies. I'm talking about eating something from a good variety of colors every day. This is a great way to get a wide range of nutrients into your diet. Dark leafy greens have slightly different nutrients than berries, so eat 'em both. 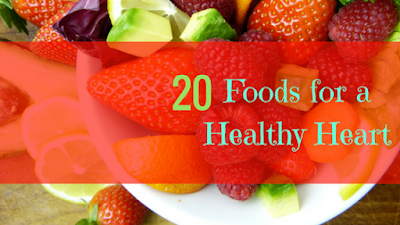 These are my top 20 heart healthy foods, so if I missed anything it might not be on my radar, please let me know so I can check it out. I also try to keep things on this blog Vegan and Gluten Free friendly, so I'm not going to include 3 of the top foods that doctors commonly recommend for the heart; fish, liver, and oats. Avocados are not the first thing that comes to the minds of most people when it comes to hearth health. They're well known to be loaded with fats, however over 75% of the fats present in avocados are unsaturated, heart healthy, fats. Add to this the amazing amounts of potassium, B-vitamins, vitamin E, other nutrients, and fiber found in avocados and you have a fruit that is amazingly great for your heart. Eating avocados and using avocado oil helps to keep your heart healthy. We are all familiar with Vitamin C being great for your immune system, but did you also know that it's great for your heart? Vitamin C helps to prevent coronary artery disease, strengthen blood vessels, and helps to widen arteries. These properties make it a very important nutrient for heart health. And what better way to consume your daily vitamin C amounts than with citrus fruit? Aside from the high amounts of vitamin C they contain, they are also loaded with fiber and other nutrients that help keep your heart healthy. We are all well acquainted with a little saying, “an apple a day keeps the doctor away.” But it might actually have some scientific validation. Apparently eating one or two apples a day has been shown to reduce plaque buildup in your arteries and reduce cholesterol levels. But don't forget to eat the peels, they're packed full of polyphenols which help prevent cardiovascular disease. Asparagus may not be your favorite veggie, but it has a lot of great benefits for your heart. It's loaded with Vitamin K, which helps blood to clot. It's also high in fiber and B vitamins. This, in addition to it's anti-inflammatory properties makes asparagus a great vegetable to eat for heart health. We've all been hearing how berries are superfoods and packed full of antioxidants. But what does all that mean for your heart? Well, blackberries and raspberries are rich in polyphenols which help to prevent cardiovascular disease. Blueberries help your memory and they also contain compounds that help to widen arteries. Strawberries contain large amounts of folate which helps to protect your heart, as well as other compounds that help widen the arteries and prevent plaque buildup. Cranberries help increase HDL (good cholesterol) and reduce LDL (bad cholesteral). Plus all berries are packed full of vitamins, minerals, and fiber. Just one handful of berries a day can help improve your health. Flaxseed has been cultivated and consumed as far back as Babylonian times. There are quite a few reasons for this, however one big benefit of consuming flaxseed is that it is a great source of fiber, Omega-3's, and alpha-linolic acid. These nutrients help reduce inflammation, prevent plaque buildup in the arteries, keep the arteries supple, lower LDL (bad cholesterol) levels, and help keep the heart healthy. Flaxseed also shows promise in helping regulate the beating of the heart and preventing heart failure. All of this in just a few little seeds. Soy's effect on the cardiovascular system has been studied since the 1960's. The findings have been mostly positive ever since. Soy helps to lower cholesterol in general, but especially LDL (bad cholesterol). It also helps to prevent coronary heart disease, lowers blood pressure, helps to widen the arteries, and keeps arteries supple. Plus it's a great source of protein. Even if you don't replace meat and dairy completely with soy products, adding a little soy into your diet can be very beneficial. These powerful little seeds have a history of being used to prolong life and vitality. One of the reasons for this is how great they are at reducing inflammation. But they also help lower blood pressure and keep your blood vessels healthy and supple. Chia seeds are high in vitamins A, D, E, and K, as well as omega-3's. Omega-3 fatty acids help to protect the heart by reducing inflammation, lowering blood pressure, and lowering HDL (bad cholesterol). Just a spoonful a day can help reduce your chances of developing major heart conditions. People are always talking about whole grains and how they're great for your heart. Well, I never hear anyone talk about quinoa. However this little grain substitute is packed full of heart healthy benefits. And a bonus, it's gluten free! It's also a complete protein without the cholesterol that most proteins have. This little seed helps to lower LDL (bad cholesterol), reduces blood pressure, keeps your arteries supple, helps widen your arteries, reduces your risk of developing heart disease, strokes, heart attacks, and heart failure. Another superfood, pomegranate has been shown to be super effective at preventing heart diseases and even reversing it in certain cases. Pomegranate does this by reducing the effects of stress on the cardiovascular system, enhancing the effects of nitric oxide (which works as an anti-inflammatory that helps keep blood vessels supple), and reducing LDL (bad cholesterol) levels. Pomegranate has been shown to even help reverse plaque buildup in the arteries, helping to reverse the onset of heart disease. Brassica is not a common word, but the vegetables can be found in each and every grocery store in America. Formerly known as Cruceiferous vegetables, Brassica vegetables include some dietary staples such as broccoli, cauliflower, cabbage, beets, and quite a few of our dark leafy greens. They are full of vitamins and minerals that are super important for heart health; potassium, folate, iron, selenium, and vitamin C, just to name a few. So help yourself to some healthy vegetables and help your heart stay healthy. Legume is such a fun word to say. Leg-yoom. But with all silliness aside (well maybe “most” silliness), legumes (beans) are great for your heart. Each different bean has slightly different nutrients, but they all are great sources of B vitamins, potassium, iron, zinc, folate, and several other nutrients that help keep your cardiovascular system strong. Dark beans, such as black beans and kidney beans, are usually considered best, but adding 3-4 servings (each serving is about 1 cup) of beans to your diet each week will help lower your risk of developing cardiovascular issues. Raisins may be small, but they pack a healthy punch. When eaten in moderation, raisins can lower blood pressure and help prevent cardiovascular disease. This is largely attributed to the high amounts of potassium contained in raisins. Potassium, along with polyphenols, tannins, antioxidants, and other nutrients help to keep your cardiovascular system health in a number of ways. All of these can be found in raisins. Nuts are great little powerhouses of nutrients and healthy fats. All nuts can help keep your heart healthy, but some nuts stand out from the crowd. Walnuts have a high concentration of healthy fats, but they stand alone because they are the only nuts that have a decent amount of alpha-linoleic acid, which acts as an anti-inflammatory agent and helps prevent plaque buildup in the arteries. Almonds have been shown to help lower LDL (bad cholesterol) levels and inflammation. Pistachios help lower blood pressure when under stress. They also help lower LDL (bad cholesterol) levels. Hazlenuts are super packed full of heart healthy nutrients that help strengthen the blood vessels. Even peanuts, who are generally considered the most unhealthy of nuts, help reduce your risk of developing cardiovascular problems. These amazing root vegetables are jam packed full of heart healthy nutrients. They're a great source of potassium which helps balance out your sodium levels and reduces blood pressure. They're loaded with fiber which helps remove cholesterol from your body. They also are a good source for Vitamin C which helps to speed healing, strengthen blood vessels, and boost the immune system. Plus, they're super fun to eat. You can find them in all sorts of colors (my favorite are purple) which helps kids (and adults) eat more of their veggies. Did you know that calcium actually helps your body maintain healthy blood pressure levels? Did you also know that spinach is a great source of calcium? Spinach is a powerhouse for your heart with it's amazing content of folate, calcium, vitamin C, and other heart healthy nutrients. Spinach has been linked to reducing blood pressure, preventing plaque buildup in the arteries, preventing strokes and heart disease, as well as preventing age related heart issues. Yet another reason to love this little green! Green Tea is known to be a healthy drink for people in general. But it's especially great for the heart. It contains polyphenols, tannins, vitamins, and minerals that help lower LDL (bad cholesterol, raise HDL (good cholesterol), strengthen blood vessels, help widen arteries, and lower blood pressure. Not only does green tea help lower the risk of cardiovascular disease, it also lowers the risk of stroke. It's not often that you get a chance to hear about the health benefits of coffee. But coffee is very beneficial when used in moderation. Drinking coffee has been shown to reduce the risk of heart failure, stroke, and heart disease. This has largely been attributed to coffee's caffine content, antioxidants, and anti-inflammatory properties. The health benefits have only been tested in people who drink up to 6 cups a day, scientists are not certain that the benefits would continue in someone who drinks over that amount. Drinking anything to excess can cause major problems. However, sometimes drinking a little can be beneficial. Take red wine as an example. Just a single serving of red wine every day can help lower cholesterol levels, and help you relax which lowers your stress levels. Red wine also contains reservatrol, which helps protect your heart from inflammation and heart disease. Chocolate is one of my absolute favorite foods. In most cases, it's a guilty pleasure. However, dark chocolate (65%+ cocoa) doesn't have to be such a guilty pleasure. It's actually been shown to lower blood pressure as well as lowering the risk of developing heart disease or having a stroke. However the milk chocolates and white chocolates out there help to increase heart problems due to their high amounts of sugar, which causes inflammation. Stick to dark chocolate and you won't have to feel guilty about chocolate anymore. If you want to learn more about how these foods can help your heart, and go more in depth about the nutrients needed to keep your heart healthy, join me at the Florida School of Holistic Living in Orlando on February 21, 2018. Hopefully you find this list helpful in your health journey. If I missed anything or if you have any questions or comments, please leave them below. I'm glad you enjoyed this post. Thank you so much for reading and commenting!